Before the Emergency Alert System (EAS) was activated on January 1, 1997, which followed the August 5, 1963 activation of the Emergency Broadcast System (EBS), there was the 1951 implementation of the CONtrol of ELectromagnetic RADiation (CONELRAD). Born out of the Cold War era, CONELRAD was devised in order to not just provide timely forewarning of enemy nuclear and/or bomber and/or submarine-based attacks, but also to silence all commercial broadcasters whose transmitting installation could potentially be exploited as homing signals for the aforementioned bad guys. The Germans had used just such a scheme during the recently concluded World War II to knock out Allied radio stations. CONELRAD used designated "clear channel" installations (no, not the moniker appropriated by iHeartMedia) whose super high power outputs would reach across the land to give warning to even remote areas. 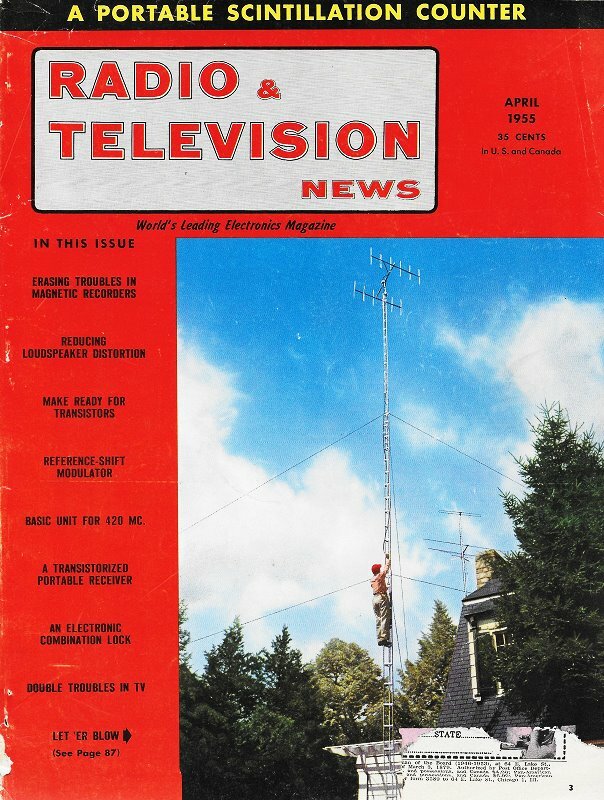 Participating stations were assigned either 640 kHz or 1240 kHz (in the AM band), while all others had to immediately stop broadcasting. The "CONELRAD" receiver in operation. 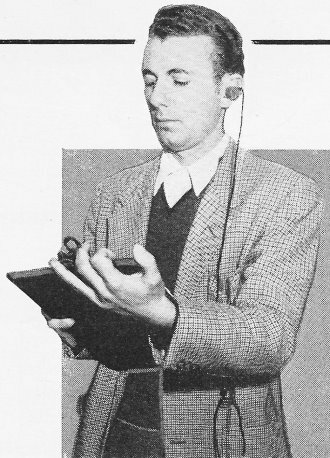 A hearing-aid type earpiece and small plastic box comprise the entire receiver. What would you do if enemy bombers were to attack our country? How do you find out quickly what is happening and what to do? This is one of the major problems facing our Civil Defense authorities today. It has been generally agreed that, in case of a tack or other emergency, cities would be evacuated as rapidly as possible, but the question still remains as to what happens to the evacuated people afterwards and how instructions and information are to be communicated to them. The best answer to date is CONELRAD. Briefly, what CONELRAD means is that during times of emergency, all TV and FM broadcasting stations will remain off the air. Every AM broadcasting station in the country will either go off the air or shift its transmitter frequency to one of two frequencies; i.e., 640 or 1240 kc. The system is officially entitled "Plan for CONtrol of ELectromagnetic RADiation." This step has been found necessary to prevent any possibility of enemy planes or guided missiles being navigated by homing equipment tuned to the operating frequency of a broadcasting station in the vicinity of the intended target location. By having all AM stations in the country operate on one of these two frequencies, no frequency-of-radiation homing device will be able to function properly. Enemy bombers that might have planned to use the signals from some of our powerful clear-channel radio stations, such as KFI in Los Angeles or WJR in Detroit, for navigational markers would find nothing but a jumble of signals at 640 and 1240 kc. A further refinement of CONELRAD now under development would provide that each station in a community be on alone for a few seconds at a time, then transferring control to another station in the same area, but always maintaining the same program material. This would protect against the possibility of an enemy aircraft riding the beam in on an extremely powerful station in a particular area. It would seem that the responsibility of the individual citizen and particularly of the electronic technician and experimenter would be to provide themselves and their families well ahead of time with some means for receiving CONELRAD broadcasts under any or all emergency conditions. This means exact calibration marks on the dials of home and car radios so that either may be easily and quickly tuned to 640 or 1240 kc. if necessary. Do not depend on tuning your radio to these frequencies at the time of emergency since most stations will not be on the air continuously and it would be almost impossible to keep tuning about the dial until one is picked up. 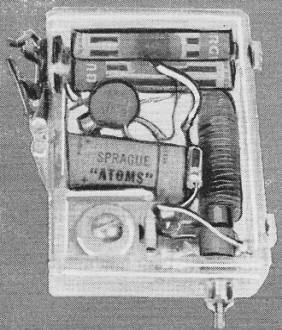 The transistorized receiver housed in its plastic case. Power requirements are very low and battery life is, as a result, long. For maximum sensitivity and best possible performance. use as long an antenna as you can and incorporate a good ground system. Construction details on a personal receiver which tunes the 640 and 1240 kc. Civil Defense bends, is compact, and cheap. The calibration may be done very easily using any r.f. signal generator, but if one is not available, many stations throughout the country run frequent CONELRAD tests, so by contacting your local radio station, you should be able to find out at what times and at what frequencies such tests are being conducted. It would also be highly advisable to have available at all times a portable battery-operated radio. The average portable radio is fairly cumbersome to carry about over any appreciable distance and its power requirements are high enough to make it impossible to keep in operation continuously. A better choice would be a unit small enough to be carried in the pocket with very low battery requirements. The writer would like to describe one small, highly portable receiver suitable for civil defense and other emergency use. The basic requirements of portability and low battery drain immediately suggest use of the transistor as a logical answer. It was therefore decided to construct a unit using two transistors, one as detector and the second for audio amplification. Some difficulty was experienced in making the transistor behave as an efficient detector. Since one of the basic characteristics of the transistor is its rather low input impedance as compared to the ordinary vacuum tube in similar applications, conventional antenna coupling circuits did not work well due to the loading effects of the transistor. This could have been remedied by using one of a number of special input circuits, tapped coils, etc., but it was decided for simplicity sake to take a small sacrifice in gain and replace the transistor detector with a germanium diode, type 1N34. A Transitron type 2N34 transistor was used for audio amplification. The complete schematic diagram of the CONELRAD receiver is given in Fig. 1. The receiver input circuit consists of a J. W. Miller "High-Q Ferrite Antenna Coil" with the polyethylene insulated antenna wire removed. A secondary winding is added by winding about 50 turns of fine wire on a paper or light cardboard form which will fit snugly over the existing winding. This pickup coil is positioned to give the best compromise between sensitivity and selectivity and then fastened in place with a dab of nail polish. The original winding which is used as the primary of the coupling transformer is tuned by a 50-400 μμfd. padder capacitor. A possible refinement, not shown, would be to have two padder-type tuning capacitors switched into the circuit by a small slide-type switch. One could then be permanently tuned to 640 kc. and the other to 1240 kc. so that a rapid and precise switch over in tuning could be made. The transistor audio stage gives ample volume on local stations using a 3 volt "B" supply, in this case two. penlite cells connected in series. No "on-off" switch is indicated, the receiver being turned "on" by plugging the earphone into J" thus completing the battery circuit. The single earphone unit clips to the case of the receiver when not in use. Fig. 1 - Diagram of the "CONELRAD" receiver. No "on-off" switch is required as plugging earpiece into the jack completes the battery circuit and puts receiver in operation. The completed unit mounts very snugly into a small plastic box as shown in the accompanying photographs. As most old crystal set men will recall, a fairly long antenna and a good ground are required for best results. For this purpose, it might be handy to tape a roll of 25 to 50 feet of fine wire to the receiver case for use as an emergency antenna. The entire unit slips very nicely into pocket or glove compartment of a car. No station identification will be used for obvious reasons, but information from any nearby station should be helpful during the emergency.